In January of this year, Friends of the Earth Middle East (FoEME) and Water Resources and Action Project (WRAP) signed a Memorandum of Understanding expressing the desire for ongoing collaboration between the two organizations. As a result of this memo, the two organizations will work together to improve water usage practices and access to potable water in East Jerusalem and Palestine. FoEME is a unique organization that brings together Jordanian, Palestinian, and Israeli environmentalists. Its primary objective is the promotion of cooperative efforts to protect shared environmental heritage. In so doing, it seeks to advance both sustainable regional development and the creation of necessary conditions for lasting peace in the region. FoEME has offices in Amman, Bethlehem, and Tel-Aviv, and is a member of Friends of the Earth International, the largest grassroots environmental organization in the world. Originally founded as “EcoPeace” on December 7, 1994 at an historic meeting held in Taba, Egypt, FoEME came about as environmental non-governmental organizations from the Middle East met with the common goal of furthering sustainable development and peace in the region. For the first time ever, Egyptian, Israeli, Jordanian and Palestinian environmentalists agreed to join forces in an effort to promote the integration of environmental considerations into the regional development agenda. The vision created by the organization is that we are neighbors sharing the same resource that physically crosses our respective communities, with the actions of one impacting the other and the state of water systems and habitats as a whole. The people and wildlife of our region are dependent on many of the same natural resources. Shared surface and sub-surface freshwater basins, shared seas, common flora and fauna species and a shared air-shed, are some of the characteristics that necessitate regional cooperation. Examples include the Jordan River Basin, a major source of freshwater in a water scarce region, the Gulf of Aqaba, a highly sensitive eco-system giving life to arguably the world”s most beautiful coral reef, and the Dead Sea, the lowest point on earth and the world”s saltiest non-shallow body of water. These are all examples of unique shared eco-systems in the region that necessitate regional cooperation if they are to be preserved. By promoting this vision, we are developing the understanding that on water and environmental issues we are in the same boat together and that we are dependant on each other for mutual long-term success. FoEME promotes this vision and understanding through joint advocacy and within its projects in the different communities, with the Amman office leading the required change in Jordan, the Bethlehem office in Palestine and the Tel-Aviv office in Israel. While the same vision is espoused in all three countries, it is tailored to the appropriate cultural context in each country. Geographical Context – The Dead Sea Rift Valley runs from the Gulf of Aqaba/Eilat, in the south, along the Arava Valley, through the Dead Sea, up the Jordan River into the Sea of Galilee and beyond, connecting the peoples of the Eastern Mediterranean. Many of our projects are located along this shared, complex ecosystem. Socio-Economic Based Projects – Focus on issues such as sustainable water use, water privatization, trade, sustainable development, water as a human security issue, developing renewable energy and healthy food practices. Climate Change – Stands on its own, as being one of the greatest environmental, social and economic threats facing the planet today, especially to our scarce water resources. All of FoEME”s transboundary projects include Israeli, Jordanian and Palestinian youth, adults, mayors and municipal representatives in community work, as well as Israeli, Jordanian and Palestinian scientists, researchers, and other experts in research based work, all working together to foster platforms for dialogue to promote environmental sustainability and peace. Major projects and research are being undertaken by FoEME, focusing on the issues of shared water crisis of Palestinians, Israelis and Jordanians. Through the development and implementation of numerous projects and scientific research initiatives, EcoPeace/FoEME has successfully demonstrated the willingness of peoples to work together to protect and rehabilitate their natural environments upon which their livelihoods depend. The integration of the top-down advocacy approach coupled with the bottom-up community approach has proven to be an effective organizational strategy that creates a platform for dialogue for peace and coexistence seeing successful initiation and implementation of cross border environmental projects. The following paragraphs outline the major initiatives that are being undertaken by FoEME. The “Good Water Neighbors” (GWN) project was established by EcoPeace/Friends of the Earth Middle East in 2001 to raise awareness of the shared water problems of Palestinians, Jordanians, and Israelis. The GWN methodology is their original idea that is based on identifying cross-border communities and utilizing their mutual dependence on shared water resources as a basis for developing dialogue and cooperation on sustainable water management. GWN has created real improvement within the water sector by developing awareness on water and sanitation issues, building trust and understanding that has led to common problem solving and peace building among communities – even in the midst of conflict. Five sets of “partnering mayors” have signed on Memorandums of Understandings focusing on a specific water issue that is negatively affecting both communities, promoting their jointly identified solutions, such as; waste water treatment networks, peace parks, better agricultural practices/wise water use, and more. Equitable water allocation between Palestinians and Israelis is an especially important issue for FoEME; as they are the only regional environmental organization in the Middle East that can tackle this issue with an excellent knowledge base, trust of both sides, and effectiveness in cooperation. FoEME has most recently offered a “Model Water Agreement” that is based on a dynamic agreement between the sides, and suggests an alternative to the “temporary agreement” in effect since 1995 that has failed to preserve shared water resources, especially the Mountain Aquifer, allowing for over pumping by Israel, pollution of groundwater and surface water originating in the West Bank and continuing into Israel, and the unfair allocation of shared water resources. A component of the GWN project is the creation of “Neighbors Paths.” The purpose of the “Neighbors Paths” is to show the natural and cultural heritage of each one of the 28 “Good Water Neighbor” communities and to learn about their water resources both in the past and in the present. Many trails highlight the rich history found in the region but also reveal degradation and pollution, often ‘not seen’ by local residents themselves and certainly not usually shown to tourists. All community-based tours deal with the issue of the interdependence of the water sources between Israeli, Jordanian and Palestinian neighboring communities. The concept of the Neighbors” Paths has been designed to achieve a synergetic effect of education, change in people”s attitudes and ultimately of sustainable development. FoEME recently launched a new component to the Good Water Neighbors project, called “Community Geographic Information System” (CGIS). CGIS is a joint Israeli, Palestinian and Jordanian educational initiative. As with most of FoEME`s projects, the CGIS revolves around shared water issues. Its purpose is to give high school students the ability to identify environmental hazards in their local area. The novelty of this project is the introduction of advanced GIS technology for the purpose of creating environmental hazard maps. These maps deal with water contamination issues and are constructed by the participating GWN communities, which seek to advance cross border understanding and cooperation over shared water issues. The community”s involvement in creating GIS maps is one more step in raising local awareness about the state of the environment in general and water issues in particular. FoEME has recently concluded an independent socio-economic and environmental assessment of the proposed Red Sea/Dead Sea canal project. 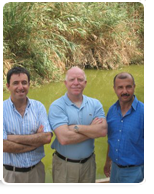 Partners in research included the Geological Survey of Israel, that studied the environmental impacts on the Arava Valley and the Dead Sea; the Royal Scientific Society (Jordan) that studied the environmental impacts on the Gulf of Aqaba/Eilat; and the Water and Environment Development Organization (Palestinian NGO) that together with the Royal Scientific Society studied the socio-economic effects of the proposed canal. This research places FoEME in the unique position as a well-informed stakeholder on the issue, giving a strong basis on which to found an opinion and launch a campaign. FoEME has undertaken scientific research projects detailing the geographical characteristics of the most important underground water source in the region – the Mountain Aquifer. FoEME first identified the major sources of pollution – sewage and solid waste. The reports describe the different solutions that have been proposed and the factors that prevent the implementation of sewage solutions or solid waste disposal facilities, as well as drawing conclusions and recommendations to protect the Mountain Aquifer. In an additional pilot project, FoEME produced “Municipal Guidelines” to help municipalities alleviate groundwater pollution of the Mountain Aquifer. FoEME researched the projections that are being made for climate change and its impacts on the water resources in a selection of Middle Eastern countries and territory; Egypt, Israel, Palestinian Authority, Jordan, along with adjacent river basin countries. The study focuses on the anticipated impact this will have on our water resources and how this will affect human societies and economies, as well as the ramifications that this is likely to have on human security and political stability within this already volatile region. The Jordan River Rehabilitation Project includes multiple studies undertaken by FoEME to raise awareness of the plight of this endangered River, to strengthen the knowledge base, and to enable political decision-makers in Israel, Jordan and Palestine to act to rehabilitate the Lower Jordan River. Their first study, “Crossing the Jordan,” aimed to bring to the public”s awareness the challenges and threats facing the River; their “Environmental Flows” study answers the question – how much water is required to rehabilitate the Lower Jordan River? Likewise, their “Economic Study” answers the question – from where and at what price can Israel, Jordan and Palestine allocate water to rehabilitate the Lower Jordan River? Uniquely, each of these studies is undertaken tri-laterally with Palestinian, Israeli and Jordanian experts working together. And an additional study, undertaken separately in each riparian country, reviews the key political barriers that must be overcome to enable water reform. The Sharhabil bin Hassneh Eco Park is embedded in EcoPeace/FoEME’s larger program of rehabilitating the Jordan River Valley, with the goal to establish a model for preserving ecologically important habitats within the Jordan Valley. The EcoPark serves to increase public awareness about the natural importance of the area and promoting sustainable development efforts in the river basin. The Jordan Valley Environmental Education Centre in Auja (“the Environmental Centre”) is another demonstration of FoEME’s commitment to advancing environmental education and sustainability in the Middle East. The Environment Centre includes outdoor educational groves and an ecotourism guesthouse. The Environmental Center plays an important role in helping alleviate the impact of water scarcity and environmental degradation on Palestinian communities through education about environmental and water realities and widespread dissemination of conservation measures. The Environmental Center also contributes to poverty alleviation in vulnerable communities through increasing capacity for sustainable, urban agriculture as well as for local provision of ecotourism services through the Environmental Center Guesthouse. FoEME”s work with WRAP will compliment the organizations” multilevel approach and ongoing projects. Through its Good Water Neighbors program, FoEME has been working with students and teachers to install water saving devices, including rainwater collection units in communities throughout Israel, Jordan and the West Bank. In addition, the eco-friendly parks established by FoEME incorporate principles of water conservation in their planning and implementation. WRAP”s board is made up of individuals with a wide range of relevant expertise including water usage management, corporate sustainability and cross-cultural communication in the Middle East. The combined experiences of the two organizations will contribute to this collaborative endeavor. The organizations will begin by installing rainwater collections units in East Jerusalem and Palestine. The first project of this kind will be conducted at the Sur Bahr Girls School in East Jerusalem. Following FoEME”s multilevel approach, the rainwater collection system will also be used as a teaching tool as students and teachers will be incorporated in the design and construction of the unit, and water usage curriculum related to the project will be given to teachers. At the same time, the project will help to bring attention to the need for improved water allocation and usage practices in the West Bank and highlight the benefits of international cooperation and expertise sharing to sustainable global development. FoEME looks forward to working with WRAP and hopes this exciting project will be one of many.